The safety of a shower can be increased with the addition of a few shower accessories. Adding safety features to a shower can enable a person to retain their independence. In addition to being helpful to people who are disabled, items such as shower wands, shower seats and long shower hoses can be helpful to the elderly and to anyone who is recovering from physical injury. These shower accessories can bring a person back to the normal routines that were once taken for granted. There are numerous affordable accessories for a shower. Some shower wands allow you perform all the hygienic acts like shaving, wiping your backside, applying lotion even if you are unable to reach those areas. 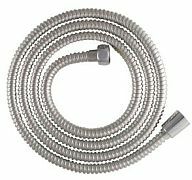 There are also long shower hoses in varying styles and lengths if you are sitting down on a shower seat and need that extended shower hose. And then there are shower wands with a long neck that come with a variety of features including spray pattern options and pause control buttons. All of these items make showering much easier for a disabled person. Multi-Use Hygiene Wands – You can wipe, wash your back, scrub your back, shave, wipe your bottom, and apply lotion with this one single device. 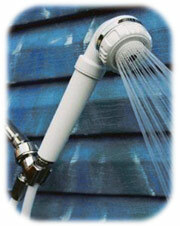 Long Shower Hoses – Extend the reach of your shower hoses so you can sit down and spray your body. Long Neck Shower Wands – Get more grip and reach with these shower wands. A shower seat is a very beneficial accessory for the disabled. A shower seat and a shower wand make a very accommodating combination. Shower seats are made in a variety of designs and also constructed of various types of material. You can easily find sturdy, inexpensive shower seats and benches that meet ADA guidelines. For a more attractive option, there are teak seats designed to fold when not in use. This might be a desirable option for a shared bathroom. It is important that a shower area be made as safe as possible for those with disabilities or for senior citizens who are trying to live independently in their home. Grab bars and non-slip shower mats are excellent safety features. Back scrubbers are quite helpful to people with limited mobility. They come in a variety of styles including those with long handles and back scrubber sponges with loop style handles. You can even indulge in a little self pampering by purchasing a dual purpose back scrubber/massage combination. Handicap shower accessories for the disabled allow them to be more independent which in turns keeps their self esteem and confidence level higher. It is important that the accessories be durable to assure safety. Check the quality of construction and know the weight limits items such as benches and chairs can support.